Many were surprised when Canada suddenly became a world-leading producer of gem-quality diamonds. Throughout the 20th century most people would never have thought about Canada being an important producer of diamonds. Most people's knowledge of diamonds was fixed on mining operations in Africa and diamond trading centers in Europe. All of this started to change in 1991 when two geologists, Chuck Fipke and Stewart Blusson, found evidence of diamond-bearing kimberlite pipes about 200 miles north of Yellowknife, Northwest Territories. One of these pipes was developed by BHP Billiton into the EKATI Diamond Mine, which produced Canada's first commercial diamonds in 1998. Surrounded by Water: Aerial photograph of the Diavik Diamond Mine located in the North Slave Region of Canada's Northwest Territories. 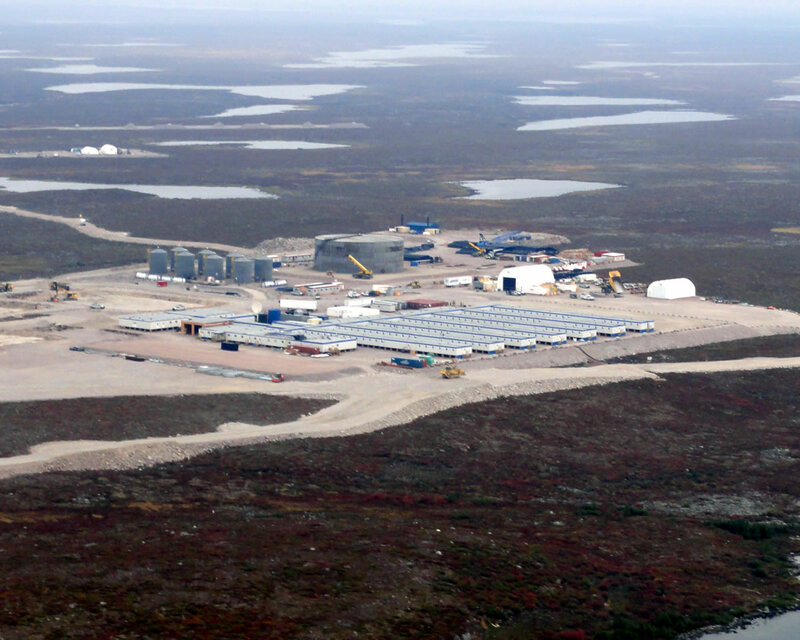 Diavik was the second diamond mine to open in Canada, producing its first diamonds in 2003. The pipes being mined were originally exposed on the bottom of Lac de Gras. Dikes were built around the pipes, and the area to be mined was dewatered by pumping. This created an island which now allows mining below the level of the surrounding lake. Photo courtesy of The Diavik Diamond Mine. The EKATI discovery launched one of the most intense mineral prospecting rushes in the history of North America. Thousands of prospectors travelled to the Canadian North. Instead of bringing wooden stakes with them to mark their claims, they all intended to purchase stakes near their destination. So many wooden stakes were being purchased by the miners that local lumber companies were unable to meet the demand! By 2006, three major mines were producing over 13 million carats of gem-quality diamonds per year. 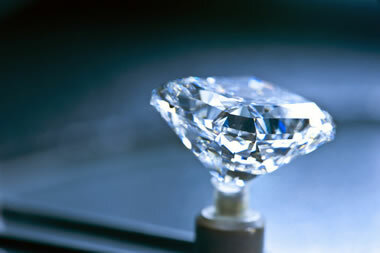 This placed Canada as the third-largest producer of diamonds in the world. The activity associated with the production of diamonds brought billions of dollars in commerce to the economy of the Canadian North. Related: What Countries Produce Diamonds? Canada's Diamond Production History: The first commercial production from Canada's diamond industry was in 1998. By 2006, three major mines were producing over 13 million carats per year, and Canada was the third-largest producer of gem-quality diamonds in the world. Graph by Geology.com using data from the United States Geological Survey. Drilling Blast Holes: In September 2012, surface mining at the Diavik Mine was completed and production moved to underground. Photo Courtesy of The Diavik Diamond Mine. Canadian diamonds have been very successful in the marketplace. They are high-quality diamonds that have been very popular in the Canadian gemstone and jewelry markets where people are excited to support the diamond industry of their own country. Much of the rough has been exported because only a small number of diamond cutters in Canada produce finished stones. Many diamonds that have been mined and cut in Canada are graded and have their certificate number laser-inscribed on their girdle along with a trade logo such as a maple leaf, polar bear, Canadamark symbol, or the words "Ice on Fire." These inscriptions help assure consumers of their diamond's origin, connect it to the certificate, and have been a very successful marketing feature. Canadian diamonds also appeal to people who are concerned about environmental and human rights issues. They are produced from diamond mines that have some of the world's highest environmental standards. In addition, the proceeds of the mines go to legitimate companies instead of groups who have obtained the diamonds through forced labor, theft or other exploitation. The certification process allows the stones to be tracked from mine through manufacturing, wholesaling and to the retail consumer. Compared to rough produced in other parts of the world, the diamonds produced from Canadian mines are very high quality which supports a high average price per carat. This is good news for mining companies. A small number of colored diamonds are produced in Canada. Occasional yellow diamonds are found at Diavik, and a few rare pinks have been found at Victor. In recent years, Canada has been one of the top three diamond-producing countries in the world on the basis of carats produced. The Diavik and EKATI mines are expected to close during the next few years. Hopefully, new mines at Gahcho Kué, Renard, and Chidliak will help Canada remain one of the world's leading producers of gem-quality diamonds. Diamond Production Leaders: Graph showing the production history of selected gem-quality diamond producing countries. This graph shows Canada holding its position as the third most important diamond producer on the basis of carats. Values for 2018 are estimated. Graph by Geology.com. Data from USGS Mineral Commodity Summaries. The EKATI Diamond Mine is Canada's original diamond mine. It was opened in 1998 by BHP Billiton, Canada, Inc. and is owned by Dominion Diamond. It was initially an open-pit mine but mining moved underground as the surface mineable ore was depleted. EKATI is located about 200 miles north of Yellowknife, Northwest Territories and about 100 miles south of the Arctic Circle. Diamonds from the mine are sold under the Aurias trade name and verified through the Canadamark service. The underground reserves currently being mined at EKATI are expected to be depleted by 2020. The company is working to develop a new open-pit operation in additional reserves on an adjacent property. These additional reserves are thought to be adequate to extend operations for about ten more years. Diavik Diamond: Diamonds from Diavik are some of the most valuable in the world. They are relatively large diamonds with exceptional clarity. Photo by Rio Tinto. Diavik was the second diamond mine in Canada to produce diamonds. Rio Tinto PLC owns a 60% stake in the mine through their Diavik Diamond Mines subsidiary. Dominion Diamond Mines ULC owns a 40% stake in the mine through their Dominion Diamond Diavik Limited Partnership. Operations at the mine are managed by Diavik Diamond Mines. Diavik is located about 200 miles north of Yellowknife, Northwest Territories and about 120 miles south of the Arctic Circle. Supplies are delivered via an ice road that connects Diavik to Yellowknife. The Diavik Stars of the Arctic: In October, 2018, Rio Tinto and Dominion Diamond Mines announced that three spectacular diamonds produced from the jointly-owned Diavik Mine would be sold at auction. 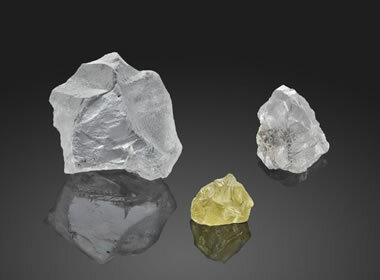 The collection includes three named specimens: "Vega of the Arctic", a 177.71-carat diamond which they report is "one of the largest and most valuable gem-quality rough diamonds ever produced in Canada"; "Altair of the Arctic", a 59.10-carat diamond; and, "Capella of the Arctic", a 24.82-carat yellow diamond. Capella is an extremely rare find. In an average year, the Diavik mine only produces about five large yellow diamonds, representing less than 0.001 percent of annual production. Photo by Rio Tinto. The pipes being mined were originally on the bottom of Lac De Gras and were discovered by drilling through the ice. To mine the pipes a dike was built around them, then the water was pumped out. Open-pit mining then began on the lake bottom, with the mine being kept dry by pumps maintaining a groundwater cone of depression. The first ore production occurred in 2003. Production moved underground in 2010 as the surface-mineable ore was depleted. The transition from surface to underground mining was completed in 2012. That same year Diavik completed construction of a 9.2-megawatt wind farm that provides over 10% of the electric power used by the mine. In late 2015 the Diavik Foxfire was unearthed. At 187.7 carats, it was the largest gem-quality rough diamond ever discovered in Canada. It is also believed to have formed hundreds of kilometers below the Earth's surface an estimated 2 billion years ago. 552-Carat Yellow Diamond: Dominion Diamond Mines announced on December 14, 2018, that a 552-carat yellow diamond was found at the Diavik Mine, located in Northwest Territories, Canada. They believe that this is the largest diamond ever found in North America. It surpasses the Foxfire, a 187.7-carat diamond, also found at Diavik in 2015, which is believed to be the previous largest diamond found in North America. Dominion plans to have the stone cut by a master diamond cutter and certified by the Canadamark program. (Rio Tinto PLC owns a 60% stake in the mine through their Diavik Diamond Mines subsidiary. Dominion Diamond Mines ULC owns a 40% stake in the mine through their Dominion Diamond Diavik Limited Partnership. Operations at the mine are managed by Diavik Diamond Mines.) Image by Dominion Diamond Mines. Click to enlarge. 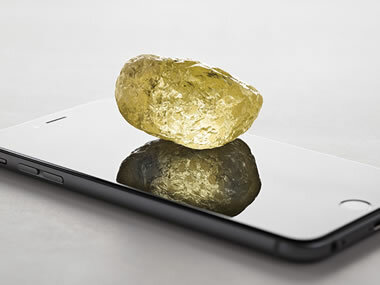 In December 2018, Dominion Diamonds announced the discovery of a 552.74-carat yellow diamond that they believe is the largest diamond ever found in North America. The rough stone measures 33.74 millimeters by 54.56 millimeters. Dominion plans to have a master diamond cutter examine the stone and plan an optimum cut. They hope that it will yield a Fancy-color main stone of significant size that will be Canadamark certified. The Jericho Diamond Mine was the third diamond mine in Canada and the first in Nunavut territory. It is located about 250 miles northeast of Yellowknife, Northwest Territories. The mine was opened by Tahera Diamond Corporation and produced diamonds from 2006 to 2008 but the company lost money. In 2010, Shear Minerals, Ltd. acquired the property with the intent of bringing the mine back into production. Related: What are "Conflict Diamonds"? High-Quality Rough Diamonds: Octahedral diamond crystals from the Diavik Mine. The mine is well known for its large diamonds of exceptional quality. Photo Courtesy of The Diavik Diamond Mine. Canada's fourth diamond mine was the Snap Lake Mine, located about 150 miles northeast of Yellowknife, Northwest Territories. The mine is owned by De Beers, and it was their first mining operation outside of Africa. It was Canada's first completely underground diamond mine. Instead of mining a vertical pipe, the mine follows a kimberlite dike about 2.5 meters thick that slopes down under Snap Lake at an average dip of about 12 to 15 degrees. The first commercial production at Snap Lake was in 2008. The mine operated for seven years without turning a profit. The mine was located under a lake and was plagued by a continuous seepage of groundwater into the mine. This water was very costly to collect, pump out of the mine, and handle before it could be released. In December 2016, De Beers announced that they planned to flood the mine to reduce ongoing pumping and maintenance costs. Production at the mine cannot be restarted without a significant effort to remove the water and return the site to operating conditions. Victor Diamond Mine: An aerial view of the Victor mine from October 2017. Image by Terry Kruger, De Beers Group. Production at Victor commenced in July 2008, and the mine produced about 600,000 carats per year. The mine's productive life is expected to be about ten years with a total production of about 6 million carats of gem-quality diamonds. The mine is expected to support production into 2019, and exceed its anticipated total production by about 1 million carats. Gahcho Kué: Aerial image of the Gahcho Kué diamond mine in Northwest Territories, Canada. Image provided by Mountain Province Diamonds. Gahcho Kué is Canada's sixth diamond mine. It is located about 170 miles northeast of Yellowknife, Northwest Territories. It is a joint venture between Mountain Province Diamonds and De Beers Canada. Production began in 2016, and they propose to mine three kimberlite pipes beneath Kennady Lake. A fourth, smaller pipe is located nearby, and it may be mined as the project progresses. Between 2019 and 2021 the mine is expected to process between 3.1 and 3.2 million tons of ore and yield between 6.6 and 7.1 million carats per year. That is a recovery rate of about 2.15 carats per ton. The company is conducting an extensive drilling and sampling plan and expects the mine life to extend beyond 2028. Renard is the seventh diamond mine to open in Canada and the first to open in Quebec. It is located in the James Bay region of northern Quebec, about 500 miles north of Montreal. The project is 100% owned by the Stornoway Diamond Corporation. Nine diamondiferous kimberlite pipes and the Lynx/Hibou kimberlite dike system are on the project property. The mine is expected to produce about 2.2 million metric tons of kimberlite per year, yield about 1.6 million carats of diamonds, with an anticipated average value of US $155/carat. The Chidliak diamond resource, a cluster of at least 74 kimberlite pipes, was discovered on Nunavut's Baffin Island in 2008. Peregrine Diamonds and BHP Billiton, the world's largest mining company, were working together to develop the project. They hoped to start an open-pit mine in 2020, but they had a huge transportation problem. They need a 160-kilometer all-weather road (not an ice road) to transport a steady stream of supplies to the mine site. The expected cost of the road was $95 million. In 2011, BHP Billiton walked away, but talks between Peregrine and De Beers developed a plan that would allow De Beers to earn a 50.5% stake in the project. De Beers walked away in late 2013. Peregrine carried on and demonstrated that the CH-6 pipe contained over 11 million carats of diamonds at a grade of 2.45 carats per ton to a depth of 260 meters. The CH-7 pipe was estimated to contain over 4 million carats at a grade of 0.85 carats per ton to a depth of 240 meters. Four other pipes are thought to have economic potential. The company also had exploration projects in Nunavut and the Northwest Territories. Then, in 2018, De Beers returned and purchased the entire company for $107 million. De Beers now believes that it owns the best undeveloped diamond property in Canada and that they will be able to develop the Chidliak property into a mine that will produce over one million carats per year for over a decade. De Beers also plans to use "FutureSmart" mining methods that will significantly reduce the environmental impact of the mine. The diamond mines in Canada face a number of challenges not faced by competing mines in other parts of the world. The first problem is their very remote location. The mines can only receive overland freight during a short "ice road" season that might last between six and ten weeks. Any supplies not delivered in that limited time window must be delivered by air. The mines must also have housing and full facilities for all of their employees because they are all located away from towns or settlements where employees could be housed. These serve as logistical and economical disadvantages for these mines. A second problem is the cost of labor. Wages in African mines and Indian cutting facilities are very low compared to the wages paid to mining and manufacturing employees in Canada. The Snap Lake mine closed without turning a profit. A third problem is the fact that the open-pit mines are being depleted, and continued work in the ore body requires underground mining - which costs about 50% more per ton of ore produced. Some of the mines also incur a high water pumping cost as they excavate below the water table. Nearby lakes serve as an infinite source of recharge water. What Countries Produce Gem Diamonds? Website article by Geology.com, 2010. Gemstones, Donald W. Olson, 2011, United States Geological Survey 2009 Minerals Yearbook. Rio Tinto celebrates opening of new diamond pipe at Diavik, Rio Tinto media release, August 2018. About the Snap Lake Mine, De Beers Canada, 2011, website article on Canada.DeBeersGroup.com. About the Victor Mine, De Beers Canada, 2011, website article on Canada.DeBeersGroup.com. Lacking Local Support, De Beers Shelves Ontario Diamond Mine Expansion, Susan Taylor, 2017, website article on TheGlobeAndMail.com. About Gahcho Kué, De Beers Canada, 2011, website article on Canada.DeBeersGroup.com. Canadian Arctic Readies for World's Largest Diamond Mine Opening, website article on Mining.com, 2015. Canadian diamond mines enjoyed great success in their first two decades. Much of that success was supported by rich ores, containing high-quality diamonds that could be produced by open-pit mining. The diamonds produced by these mines were favored by consumers who value diamonds produced from mines that are environmentally responsible and conflict-free. Canadian customers have also patronized gems that are obviously marketed and marked as a Canadian product. Related: How Do Diamonds Form ? Although exploration for new deposits continues, the pace has dropped dramatically from the original boom. New discoveries in Alberta, British Columbia, Northwest Territories, Nunavut, Ontario, and Quebec are being evaluated, and some of them might be developed into profitable new mines.